The Online Portal is Malanadutv.com is Showing the Aranmula Boat Race Live. The Portal will show the Aranmula Vallamkali 2014 From, 9.00 A.M Onwards on Wednesday, 10th September 2014. 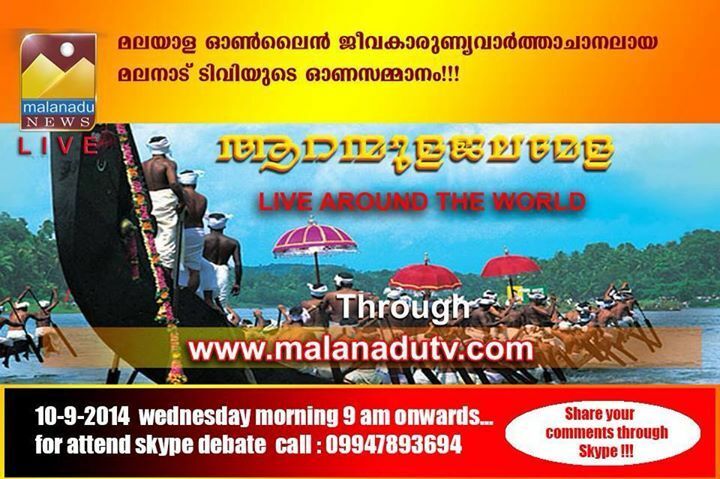 Watch http://malanadutv.com/ for The Live Streaming of Aranmula Boat Race. Aranmula Boat Race Aka Aranmulla Uthrittathi Vallam kali Date is 10th September 2014. Aranmula Boat Race Is Held at The Pamba River at Aranmula Partha Sarathi Temple. Palliyodams (Snake Boats) are Conducting In Aranmula Uthrittathi Vallamkali. Ashtami Rohini Vallasadya, Vanchipattu, are related to The Aranmula Vallamkali. Live Telecast Details – At Present No info about the Aranmula Vallamkali 2014 on Television Channels.